It is safe to assume that Mike Huff is a South African singer, since nothing can be found online about this performer. 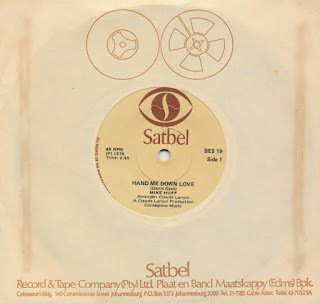 All I could find out is that he released two singles on the South African Satbel label: 'I can't wait to dream' and this single, 'Hand me down love' - both in 1976. The B-side of this single is what got my attention: it's a cover version of the song 'Come back and love me' - and that, of course, was released in 1975 by Shannon. And Shannon was the nickname of Marty Wilde, who hoped to have a chart success with that song. A very obscure cover version of that song, then, ordered directly from South Africa. It was send to me on July 2, and it arrived.... today. You'd think that even the mail could be faster in this day and age, but no.